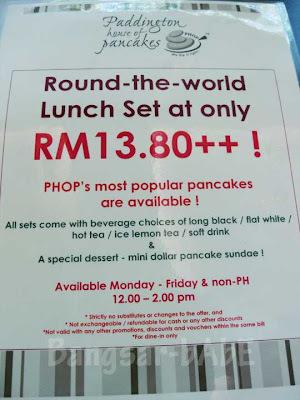 Paddington House of Pancakes is currently having the Round-the-world Lunch Set for RM13.80++. Since we were in 1 Utama and didn’t know where else to eat, I got Shum to try this with me. 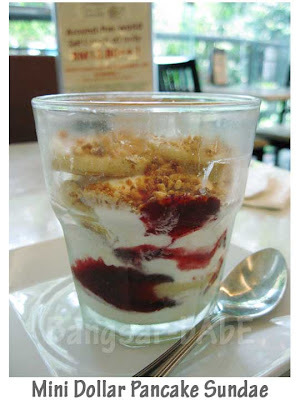 There are 8 set choices available, and they each come with your choice of beverage (long black, flat white, hot tea, ice lemon tea and soft drinks) and dessert (mini dollar pancake sundae). 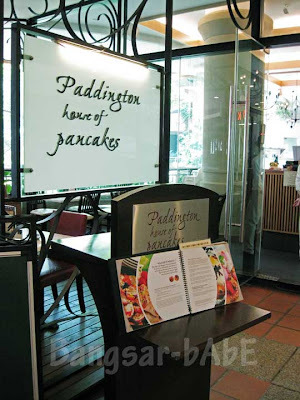 Apart from the Treasure Box, I have never tried the other pancakes from Paddington. Undecided, I chose the set that looked most appealing (to me) from the picture and description. Shum chose the Brussels Set and got herself a long black. My flat white lacked distinct coffee flavour and tasted rather insipid. Luckily, they agreed to make me a new one. 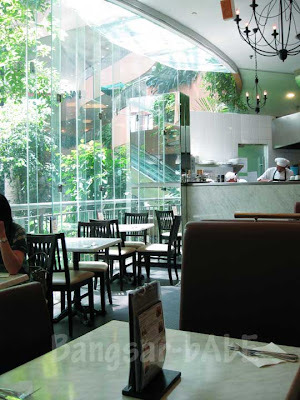 I like the ambiance (only in 1 Utama) because the place has a lovely view of the rainforest. 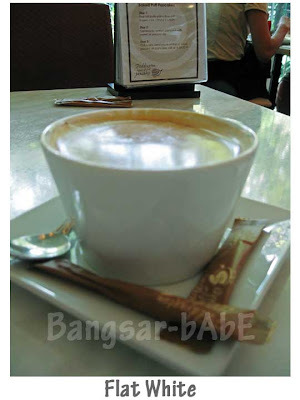 Plus, it’s away from the shopping crowd so it’s a nice place to chat. 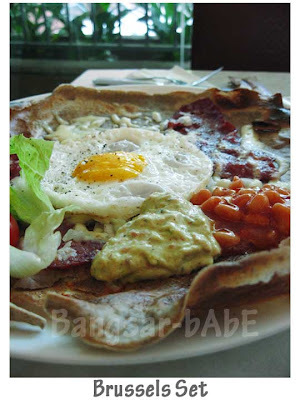 The Brussels Set comprises of bacon, onions, mozzarella, sunny side-up, baked beans and guacamole on top of a 10″ buckwheat galette. 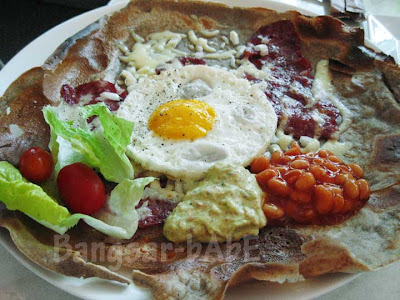 The galette was paper thin, crispy at the sides but sadly, rather bland. It gets the flavours from the bacon stripes and stringy cheese. I thought this was better than my set, but Shum said she wouldn’t eat this again. It looked good from the picture, but the Tokyo Set fell short in taste. Grilled chicken thigh topped with tomato based gravy, ham and mozzarella, it came with a side of mashed potatoes and rolled pannekoek. The chicken was tough and dry at the sides. While the gravy and cheese gave it more flavour, it was far from great. 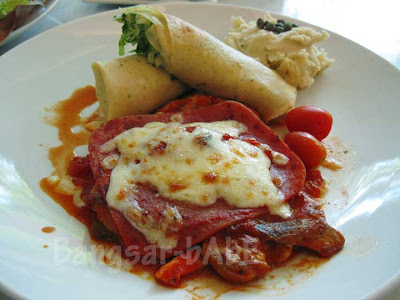 The rolled pannekoek resembled a “popiah” with lots of lettuce. This tasted bland, and so did the mashed potatoes. Dessert on the other hand was a pleasant affair. Fluffy pancakes with creamy vanilla ice cream and strawberry jam, we enjoyed every spoonful! *Dollar pancakes (also known as Poffertjes) are a traditional Dutch treat usually served with powdered sugar and butter. 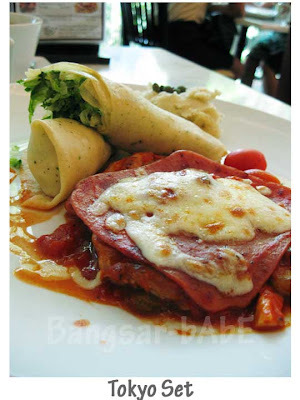 Our lunch cost RM31.95 inclusive of 5% tax and 10% service charge. While the mains failed to impress, I wouldn’t mind returning for their desserts. Verdict: I’d stick to their desserts from now on. hmm….so, I shall check out their dessert ONLY. Thanks for sharing! 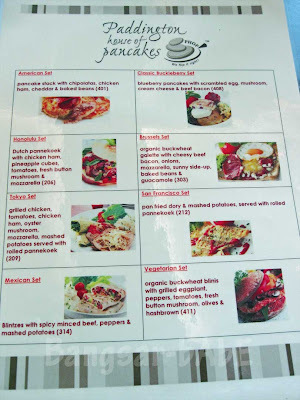 I’m sure there are a few nice savoury pancakes available…as their menu is really extensive. 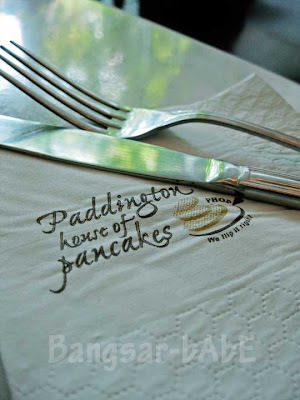 i lurrrrrve paddington, but there are just toooo many choices on the menu. i once spent nearly 20 minutes with someone trying to decide what to order! too bad, but it sure looks inviting! hey, i pimped u, i hope u dont mind. foodbin – Yeah…a real pity. =( But who knows, you might like it better than I do! sc – Mmmmhmmmm…the desserts are yummy! wah … so cheap one! cz the Tokyo was about RM20-30 per serving if ala carte! the full form lah, i think slightly bigger portion. flat white=tasteless. hehe ..so aptly named. RM13.80 for a set lunch @ Paddington.. that’s seriously cheap if compared to my last meal there.. one ala carte dish easily exceeds RM30! i never went back ever since i saw them stuff things into the microoven..most of their stuff r reheated…so yuck! 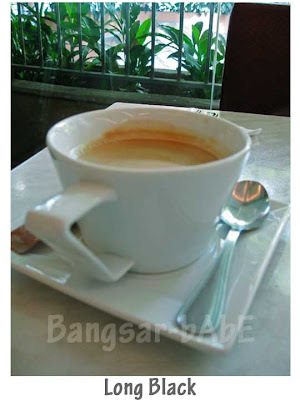 vkeong – It’s cheaper, but the ala carte portions are much more fulfilling. Joe – Hmmmm…that explains the tough and dry chicken! I guess they want the lunch crowd. only chicken ham right ? >.<"
but its true.their food not consistent laa..